Sign Up for free to save time shopping Hot Mess Kushmetics's wholesale products on LeafLink. "CBD Topicals for the skincare snob"
CBD Topicals for the skincare snob. 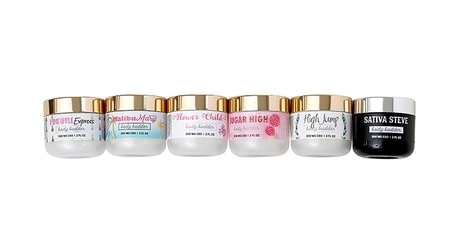 At Hot Mess Kushmetics, we combine the highest quality CBD with the highest quality skincare ingredients to create a therapeutic product that will leave your skin feeling pampered and silky smooth. We only use natural and safe ingredients in our products. With 0% THC, all of our products are legal in all 50 states and able to be shipped across state lines. CBD is more permeable to the skin than THC, making it the obvious choice for cannabis infused topicals. We LOVE our dispensaries and budtenters and want to make sure that you are taken care of too! That's why we give you an additional 10% of your order in FREE goods. Distribute them to your employees or your favorite patients. Who says baths have to be boring? 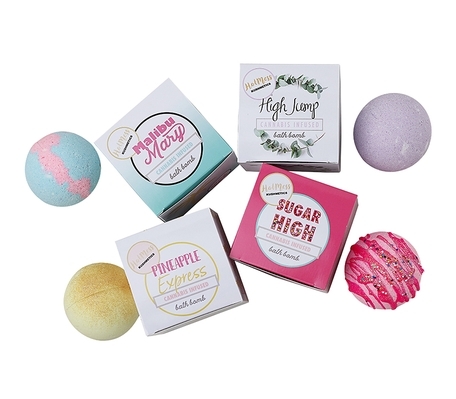 Each Bath Bomb contains 50 mg of CBD and is perfect for full body pain, headaches & migraines, back pain, and more. No sulfates parabens PEGs or cornstarch. Vegan and never tested on animals. Each bath bomb comes packaged in a pretty little box. When pain becomes too much to bear, Body Budder is the perfect choice. With 4 times the potency of our Body Lotion, Body Budder contains a whopping 200 mg of CBD in each 2 oz jar. Individual jars wholesale for 17.00 and are sold in cases of 8. SRP is $34. Available in 6 different fragrances. 4 oz Body Lotion available in 6 different fragrances. 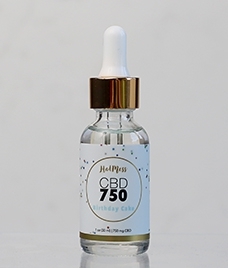 Each bottle contains 100 mg CBD, 0%THC. No sulfates parabens or PEGs EVER! Vegan and never tested on animals. Sold in cases of 9. Each individual bottle wholesales for 13.50 ea, SRP- $27. 8 oz Body Lotion available in 6 different fragrances. 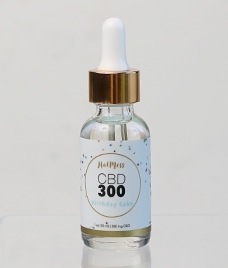 Each bottle contains 200 mg CBD, 0%THC. No sulfates parabens or PEGs EVER! Vegan and never tested on animals. Sold in cases of 9. Each individual bottle wholesales for 19.50 ea, SRP- $39. CBD infused bubble bath is available in 4 different fragrances. Each bottle contains 150 mg of CBD and last for 6-8 baths. Sold in cases of 9. Individual bottles wholesale for 14.50, SRP: $29 / Sold in cases of 9 bottles. 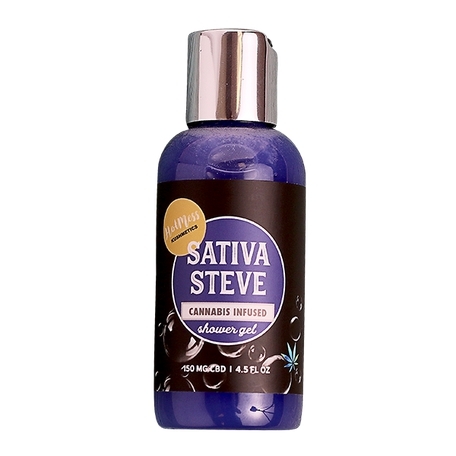 CBD Shower Gels are the perfect way to include pain relief therapy in your every day routine. Our Shower Gels are vegan, sulfate-free and paraben-free. Our CBD tinctures are the perfect solution for patients struggling with pain, anxiety/depression, seizures, migraines and more. We offer 6 delicious and unique flavors (including unflavored which can also be used for pets). 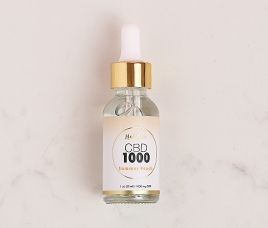 Our 1000mg tinctures offer 33 mg per full dropper. Our CBD tinctures are the perfect solution for patients struggling with pain, anxiety/depression, seizures, migraines and more. We offer 6 delicious and unique flavors (including unflavored which can also be used for pets). We manufacture our tinctures ourselves which means we can offer them at a lower price to you, compared to other brands who purchase their oils from a third party, driving up the cost.